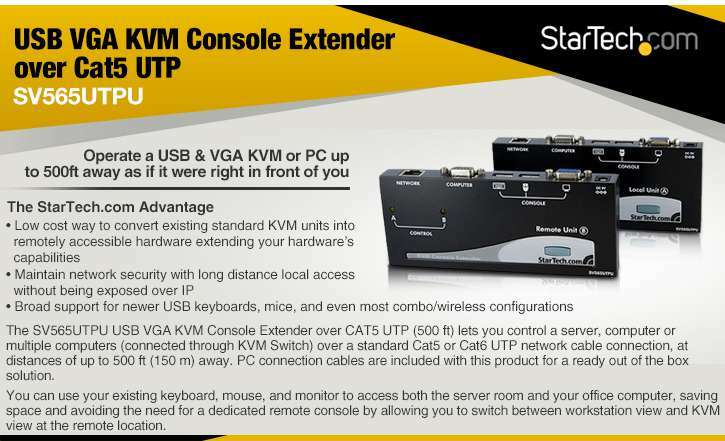 Connect your computers up to 150m away with the StarTech USB VGA KVM Console Extender over Cat5 UTP. 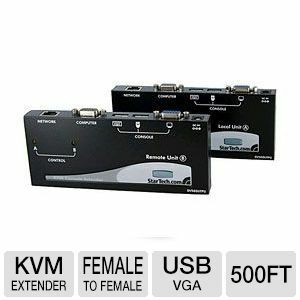 This console extender lets you control the server, computer or multiple computers connected via the KVM Switch with over a standard Cat5 or Cat6 UTP network cable connection at a distance of up to 500ft away. And with this extender you can utilize your existing keyboard, mouse and monitor to access both the server room and your office computer. Hence, this lets you save up your space and avoid the need of remote console by letting you switch between workstation view and KVM view. It comes with connector A that is equipped with USB Female and connector B equipped with VGA Female. Take with you the StarTech USB VGA KVM Console Extender over Cat5 UTP today!